Rémy Le Boennec, Researcher at VEDECOM Institute and LGI CentraleSupélec (Université of Paris-Saclay), in collaboration with Isabelle Nicolaï (LGI CentraleSupélec, Université Paris-Saclay) and Pascal Da Costa (LGI CentraleSupélec, Université Paris-Saclay), has set out a study within a research project dubbed the Institut VEDECOM New Mobility Offers Observatory [Observatoire des Nouvelles Solutions de Mobilité de l’Institut VEDECOM]. It is assessing fifty emerging mobility offers on the basis of sustainable development indicators and local characteristics. The aim is to help decision makers to construct their own relevant and viable scenarios for instigating new mobility initiatives in their territories. Here we feedback on the study that featured at the international Transport Research Arena (TRA2018) conference which took place from 16-19 April in Vienna. The traditional “either/or” view of private cars vs. public transport is waning and many now see the automobile as “public transport of tomorrow” that will supplement local government schemes in places and at times that are currently not competitive (sparsely populated areas, evenings, etc.). Heralded for their convenience, 64% of rural French people and 44% of those living in conurbations of more than 100,000 inhabitants use cars daily. However, they bring with them their share of disadvantages (noise, pollution, greenhouse gas emissions), accidents and traffic jams. At the same time, the advent of inclusive transport concepts, which aim to provide tangible and affordable solutions to categories of the population that do not have access to “standard” forms of mobility, encourages a rethinking of getting from A to B and improvements to the institutional framework that encompasses this. Actually adopting new sustainable mobility offers requires overcoming both psychological and sociological obstacles. Despite encouraging signs of development, users who regularly go inter-modal, i.e. combine several modes of transport on the same journey, or multi-modal, meaning that they alternate between several transport modes on different journeys, still represent a very small percentage of the overall population. This study, which was presented at the TRA2018 conference, was carried out to reduce both social and geographical costs. It also supports changes in behaviour and takes into account the profusion of new mobility offers in the decision-making process. The Observatory aims to assess new mobility offers for decision-makers, looking at the relevant socio-demographic and geographical characteristics of each type of area in terms of their specific population and employment density and population flows. For any given journey, each solution assessed has been compared to a private combustion-engine car used by a single driver. The particularities of each area are crucial. For example, though car-sharing solutions have proved suitable for city centres, they rarely are in less-densely populated areas. Likewise, Uber’s success is linked to the short distances to cover in city centres. The question is, how do we identify the characteristics of inter- and multi-modal users to transfer them to people who use cars exclusively, thus helping transport operators, both long-standing and new to the market, to design new offers that are appropriate for the target market and economically sustainable. The assessment carried out within the New Mobility Offers Observatory project will go hand in hand with establishing territorial profiling. For example, for the Ile-de-France Region in France, different types of areas have been identified, from central Paris to periurban and rural areas. The particularities of each type of area in terms of travel require the use of different mobility offers. In central Paris, long-standing (public transport) and emerging offers (shared bikes, kick-scooters and electric scooters) coexist, making it difficult to manage transport policies that best navigate the different solutions. In close suburbs, the use of bike- and car-sharing is often on top of long-standing public transport methods. In the rest of the Paris conurbation, public transport networks are still dense, but given the large distances covered, it is difficult to offer uninterrupted mobility services: for example, when you pick up a shared bike from one station you need to have the possibility of dropping it off in a more remote place. In the medium-sized towns in the rest of the Ile-de-France region (in periurban areas), mobility services are usually organised around the train stations. Lastly, in other municipalities of the Ile-de-France Region (and farther) that do not have a train station, outside of isolated experiments, we have seen a real lack of mobility offers that offer an alternative to private cars in those less densely populated areas. To try to offer solutions to these various problems, the New Mobility Offers Observatory is assessing fifty mobility offers, most of them emerging ones. It uses an innovative, two-step method. The first involves attributing a consolidated score, based on 18 indicators, to each of the offers after a Multi-Criteria Decision Analysis (MCDA). 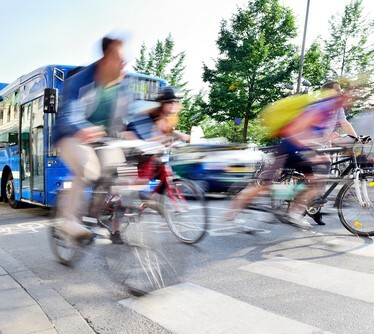 The chosen indicators have been elaborated into assessment process measurement indicators and approved by a group of transport experts, including researchers, manufacturers and local authorities. The selected criteria cover the three fields of sustainable development: economic, environmental and social. After being put through Diviz software, the results show that in very densely populated areas, such as central Paris, private combustion-engine cars are not very efficient (due to more environmental criteria in central areas), unlike less densely populated regions, where private car use is widespread, primarily out of habit and for practical reasons (saving time, etc.). For similar reasons, carpooling emerges as an environmentally friendly alternative in less-densely populated areas. Conversely, a private electrical car’s efficiency diminishes the further you travel from densely populated areas. 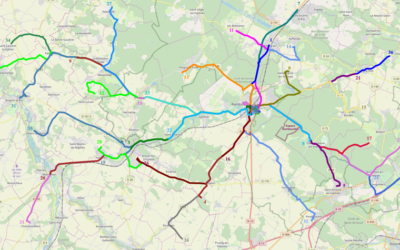 The use of active-travel sharing solutions (e.g. Velib shared bikes in Paris) is only usually viable and practical in city centres. Driverless shuttles appear to work along the same lines, both because the speed of travel makes them less competitive than combustion engine cars in less densely populated areas, but also because environmental concerns are less widely felt (environmental criteria less weighted in less densely populated areas). Surprisingly, walking earned the highest score, regardless of the type of area under consideration, as much for economic (low cost to the user) as environmental or even social reasons (practised almost universally, trust in the method, etc.). In the second stage, software called MICMAC is used to map influence and dependence between the 18 indicators. For each type of area, it compiles a matrix of the interactions between the different criteria, taken two by two. The final result is a criteria influence and dependence map that can be used to develop one or two territorial scenarios for designing innovative or hybrid mobility offer. Carpooling represents a similar spatial profile to private car use, with relatively higher efficiency in periurban and rural areas. However, it is still under-used. Active modes, particularly walking, need to be encouraged by public authorities everywhere, specifically by rolling out rules and infrastructure that guarantee that it is possible, safe and comfortable, and provides easy access to shops and businesses. Lastly, in less densely populated areas, walking obviously needs to be combined with other modes of transport. Efficient distribution of multi-modal transport information, which also gained high scores across all types of region, could be successfully deployed here. 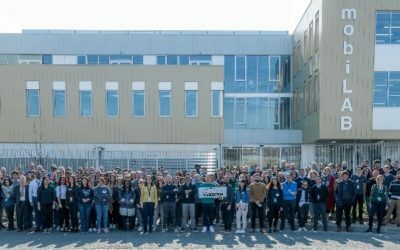 VEDECOM celebrates 5 years ! Mobile Hyperplace Project. Autonomous and connectected vehicles : what are the impacts on our mobility and the way we live tomorrow ?